On Monday, May 21, the Supreme Court handed down a decision that effectively strips nonunion workers of any effective means of enforcing their legal rights to minimum wages, overtime, protection from sexual harassment, or any other labor rights. At issue in the consolidated set of cases — NLRB v. Murphy Oil, Epic Systems Corp. v. Lewis, and Ernst & Young, LLP v. Morris, collectively known as Murphy Oil — was the question of whether employers can require workers to give up their rights to join class action suits to enforce their legal rights. It has become an increasingly common practice in non-union workplaces for bosses to require, as a condition of employment, that prospective employees sign a contract agreeing to resolve all legal disputes through a system of individual arbitration. Prior to this decision, courts had held that workers’ rights to concerted activity, guaranteed under Section 7 of the National Labor Relations Act, protected their right to join a class action lawsuit and superseded arbitration agreements. In Murphy Oil, however, the 5-4 right-wing majority on the Supreme Court overturned that precedent, narrowly construing the right to concerted activity under the NLRA to be limited to union organizing and bargaining. Why Are Class Action Suits Important? Class action suits are in many ways similar to collective bargaining. In a unionized workplace, workers have access to a grievance procedure and are members of an organization that can represent them through the grievance process. If a grievance affects multiple workers, the union can negotiate a settlement that compensates all affected workers for their loss (makes them “whole”). 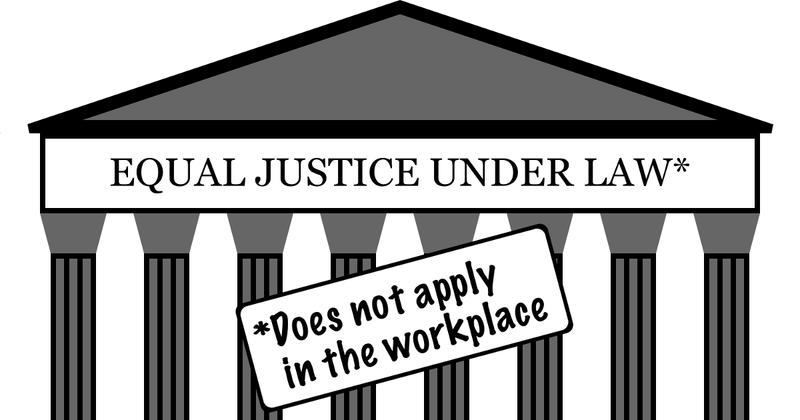 In a non-union workplace, workers must rely on the law to protect them. If an individual worker sues their employer for, say, wage theft (not being paid for hours worked, or not being paid overtime), the amount that they can recover as damages can often be less than the cost of legal representation. Even if a single determined worker wins an individual lawsuit (or arbitration, if they have signed an arbitration agreement), every one of their coworkers who is facing the same issue has to take up a similar legal or arbitration case individually. Class action lawsuits allow workers to establish a “class” of workers (for example, all workers who have been affected by wage theft, sexual harassment, or racial discrimination at a company), and then sue the company on behalf of the whole class of workers. This spreads the cost of legal representation across a larger pool of workers, and makes acquiring professional legal representation more financially feasible. This is far from the first time that the Supreme Court, the least democratic branch of our government, has ruled that the interests of the wealthy and corporations trump the rights of workers. Indeed, one of the most notorious Supreme Court cases, the Dred Scott case, concerned the rights of bosses to literally own their workers. Dred Scott was an enslaved man of African descent who sued for his freedom in 1846, basing his case on having lived in the free state of Illinois and in Wisconsin Territory, where the U.S. Congress had prohibited slavery. In ruling against Scott, the Supreme Court essentially held that the property rights of Scott’s “owner” were more important that the human rights established by the state of Illinois or the U.S. Congress when they abolished slavery. Intended to settle the question of slavery once and for all (in the interest of slaveowners), the decision instead contributed to the increasing militance of the abolitionist movement. Dred Scott was not overturned by persuasive legal arguments, but by the Civil War. After the war, the U.S. ratified the 13th, 14th and 15th Amendments to the Constitution, commonly known as the “Reconstruction Amendments.” These amendments abolished slavery, guaranteed equal protection under the law, and prohibited discrimination in voting rights, respectively. But the 14th Amendment went on to have its own strange career. In the late 19th century, as the country industrialized and the power of corporations grew, workers attempted to address low wages, long hours and sweatshop conditions both by organizing unions and by pressuring politicians to pass laws to establish labor standards. Most of these labor laws were struck down by the Supreme Court, claiming that they violated the 14th Amendment due process rights of the employers and corporations they were intended to regulate. In Lochner v. New York (1905), the court held that a New York law giving bakers a 10-hour day and 60-hour week was an unconstitutional restriction on the “freedom of contract” of the baker owners. This case inaugurated the so-called “Lochner Era,” in which it was common practice for the court to use the 14th Amendment to strike down any form of economic regulation by states. Even after the rights of workers to collective bargaining and labor legislation were accepted by the Supreme Court in the 30s, the court continued to limit the rights of workers in cases such as Teamsters v. Vogt (1957), in which states and courts were given wide latitude to restrict workers’ free-speech rights to engage in picketing. Militant, collective action by working people has been the basis for moving the Supreme Court in a more progressive direction. As the great scholar of Reconstruction W.E.B. DuBois observed, what broke the back of the Confederacy during the Civil War — thus making 13th, 14th and 15th Amendments possible — was a general strike by enslaved African-American workers. They stopped working, sabotaged the Confederate war effort, and left the plantations en masse to join the Union Army. Constitutional scholar and historian Bruce Ackerman has suggested that the New Deal era represents a similar “constitutional moment” to the post-Civil War Reconstruction era, even though no formal amendments were made to the Constitution. During the 1930s, the Supreme Court moved away from the “Lochner era” and towards a view of the Constitution that allows the government to take appropriate measures to protect the people’s well-being. After Franklin Delano Roosevelt was elected president in 1932, most of the legislation that he promoted to help working people survive the Great Depression was struck down by the Supreme Court — most notably the National Industrial Recovery Act, whose Section 7(a) encouraged unionization. While Roosevelt was eventually able to appoint a majority of Supreme Court justices, the turning point in the “constitutional moment” of the New Deal occurred before he was able to appoint a single justice. Faced with a rising tide of popular mobilization, expressed in the growth of the CIO, Roosevelt’s landslide reelection in 1936, and a wave of sit-down strikes, the court chose a labor case, NLRB v. Jones & Laughlin Steel Corp., to signal its capitulation to popular demands. Jones & Laughlin upheld the constitutionality of the National Labor Relations Act, and it paved the way for the widespread unionization that resulted in the mid-century “Great Compression”  that made the U.S. a vastly more equal society than it had been. In recent months, teachers in several so-called “red” states have coalesced around support for a right to quality public education and to fundamental union rights. Other citizens have organized in support of health care for the needy and perhaps for all, forcing even conservative legislators to reject repeal of Obamacare. Meanwhile, a few judges and Justices have drawn new attention to how the law fortifies inequality, have taken up constitutional claims against economic inequality, and have fleshed out substantive constitutional arguments in support of a more egalitarian distribution of power and resources. In short, a constitutional vision that diminishes, rather than fortifies, economic inequality may be hard to achieve, but it is not unimaginable. Working people have faced down the Supreme Court before. Murphy Oil and the most likely outcome in Janus will be blows to our rights and our unions, but with solidarity, militancy, and creativity — and assistance from progressive lawyers, judges and legal scholars — there is no reason to think we can’t turn the court in a more progressive direction again. Jonathan Kissam has been UE's Communications Director and editor of the UE NEWS since August, 2017. Prior to that he was a rank-and-file member of UE Local 203 in Burlington, VT. From 2002-2004 he served on UE's General Executive Board as the Secretary-Treasurer of what was then UE District Two.